Washington Post columnist Dana Milbank offered up a glib and flabby column yesterday, arguing that the false charges of incitement raised long ago in the McKinley assassination should serve as a cautionary reminder to the likes of Sarah Palin and Fox News commentator Glenn Beck. He recalled–and not entirely accurately–the efforts in 1901 to link the contents of William Randolph Hearst’s newspapers to the fatal shooting of President William McKinley. I discussed that topic in a post Monday at Media Myth Alert, noting how extreme and wrong-headed attempts to exploit and politicize the weekend’s shooting rampage in Tucson was reminiscent of the smear campaign against Hearst following McKinley’s slaying. The rampage in Arizona left six people dead, including a federal judge. Congresswoman Gabrielle Giffords was severely wounded. Milbank’s column seizes on the shootings in Tuscon as a pretext to condemn the views and rhetoric of Palin and Beck, neither of whom I much care for. A “McKinley moment”? Meaning what? An occasion for self-censorship because of the insinuations and false allegations raised against them in the aftermath of the shootings in Tucson–much as false allegations were raised against Hearst following McKinley’s slaying? Not only is “McKinley moment” an imprecise construct: It suggests that using smears to batter foes into silence is somehow worthy or admirable. “The outcry against Hearst’s incitement–there were boycotts and a burning in effigy–dashed his presidential ambitions. A more fitting and appropriate response from the violence in Tucson would be not to seek to mute the rhetoric of foes, but to condemn the smear, to call attention to the hazards of battering opponents with indirect and groundless allegations of incitement. Hearst was so battered in 1901. He, not unlike Palin and Beck, was a brash and controversial figure, easy to dislike. Hearst’s aggressive, activist-oriented approach to newspapering–his yellow journalism–shook up New York City’s media scene in late 1890s and served as a platform for his political ambitions during the first decade of the 20th century. But Hearst was no villain, no violence-monger. As I write in my latest book, Getting It Wrong, Hearst almost surely never vowed to bring on the Spanish-American War of 1898, although that hardy myth is often invoked and readily believed. Milbank’s column suggested that Bierce’s commentary was published in the Hearst papers some six months before McKinley was shot. In fact, it appeared 20 months before the assassination, in a quatrain about the fatal shooting of William Goebel, the governor of Kentucky. Bierce said he meant to call attention to risks of not finding and prosecuting Goebel’s killer. Milbank’s column, moreover, erred in claiming the uproar that followed McKinley’s assassination “dashed” Hearst’s presidential ambitions. Hearst mounted a serious bid for Democratic nomination for president in 1904. He was by then a congressman, and his presidential bandwagon gathered some momentum during the first months of that year. In the end, though, his candidacy was doomed–not by the smears and fabrications raised after the McKinley assassination but by the reluctance of William Jennings Bryan to embrace Hearst’s bid. 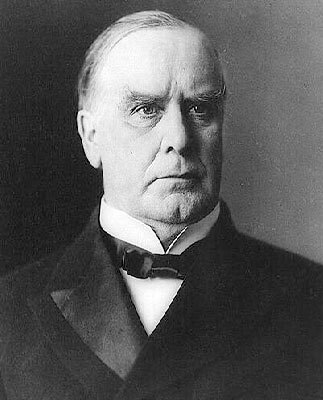 Bryan, who lost presidential elections to McKinley in 1896 and 1900, had been expected to endorse Hearst for Democratic nomination in 1904. After all, Hearst had supported Bryan’s ill-fated campaigns for the presidency and had even financially supported Bryan’s travels in Europe following the 1900 election. When Bryan did not deliver the hoped-for endorsement (thinking, perhaps, he might again emerge as the party’s standard-bearer), Hearst’s candidacy was faded, according to David Nasaw, Hearst’s leading biographer. Still, Hearst pursued his bid for the nomination to the Democratic convention in St. Louis in 1904. He lost by a wide margin to Judge Alton B. Parker. Parker in turn lost the 1904 election in a landslide to Teddy Roosevelt, who as vice president had succeeded McKinley to the presidency. The “McKinley moment,” as Milbank used the term, seems a misnomer. More appropriate and accurate would be to call it the “Hearst moment,” given that Hearst was the target, the victim, of distortion and falsehood. The “Hearst moment” offers a useful and pertinent reminder about the use and effect of the smear. at Instapundit for linking to this post.